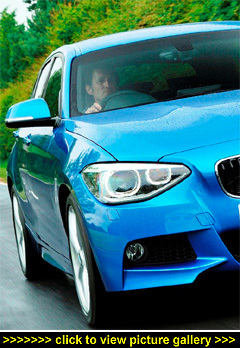 THE 'LITTLE' OF THIS ENTERTAINING 'little' and 'large' duo is the tax-efficient 116d EfficientDynamics five-door sports hatch priced from �,885  unlike the potent new M6, its headline figure is not its acceleration but the 99g/km emissions that make it the first ever BMW car to get below 100g/km. The four-cylinder, 1.6-litre turbodiesel engine produces 114bhp with peak torque of 191lb ft from 1,750rpm. It's a scaled-down version of BMW's 2.0-litre 320d ED unit (reviewed last week) which produces 109g/km and which on my week-long test drive returned an amazing 66mpg. Obviously there is keen demand from business and fleet customers because the 320d ED saloon has already become the best selling 3-Series model in the UK. What the 116d ED's low 99g/km figure results in for retail and business users is �cost for road tax, 13% Benefit-in-Kind, exemption from the London Congestion Charge and, for businesses, the price of the car can be written down by 100% in the first year of ownership. Officially this 116d will return 74.3mpg and during my brief test drive around the busy winding country roads of West Sussex, the five-door 116d ED I was driving returned 58.8mpg. I expect more motorway and open road use will improve that to around 70mpg given the performance of the larger 2.0-litre 320 ED unit. This 1.6-litre ED unit does not achieve is first class fuel economy and low emissions by being a dull unit  top speed is 121mph with zero to 62mph taking an acceptable 10.5 seconds. With fifth (and in particular sixth gear) being long-legged ratios, liberal use of the gearbox is required if quick overtaking engine response is needed. However, once you're in top gear and 'cruising', the engine is quiet and frugal with a capital 'F'. The secret to its miserly fuel use and low emissions is, of course, BMW's award-winning EfficientDynamics technologies featuring extensive use of intelligent energy management systems. These include Auto Start-Stop in both manual and automatic transmissions  the latter a first-in-class with eight speeds. There is also an ECO PRO mode, activated using the Drive Performance Control fitted as standard. This feature adjusts various on-board systems to maximise efficiency. When in ECO PRO mode the throttle response is adjusted to encourage a more economical driving style; the extra economy created is fed back to the driver with the in-car displays showing the additional number of miles achieved. Other 'eco' features include 16-inch alloy wheels fitted with low rolling resistance tyres  not run-flats, so the ride is more supple than other 1-Series models although on poorer roads the ride remains on the firm side. Note that although these second generation 1-Series hatchbacks are slightly larger than the originals, the interior space remains snug. In its favour: Miserly fuel use, low emissions, low taxes, and no price premium for EfficientDynamics technologies. Against? Snug interior.